Melbourne Harbor Condominium is situated on scenic Melbourne Harbor in Melbourne, Florida. The condo is also on the Eastern side of Historic Downtown Melbourne, which has recently been designated a Main Street U.S.A. site. Unit #103 is on on the waterfront, on the ground floor. Parking is literally steps out the front and back door. Unit #103 is equipped with a full kitchen, 2 TV's, ceiling fans, sleeping facilities for up to 4 people, and almost 700 sq feet of living space. It is comfortably furnished to give you that 'at home' feeling. 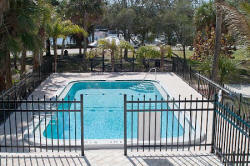 There is a pool on the grounds, a small park out the back door, and several more parks within walking distance. 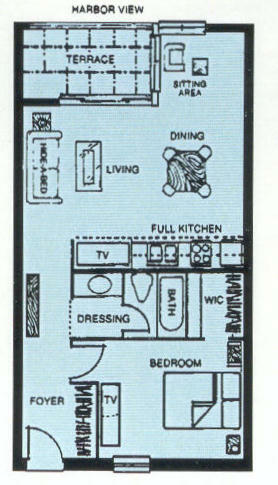 This unit is great for a summer vacation, winter stay, or for business travelers in town for an extended period. It is also very close to Holmes Regional Hospital Medical Center and would be perfect for visiting medical professionals, extended treatment, or hospice situations. For contractors on extended stays in Melbourne, we are within a 10 minute drive of Harris Corporation, Intersil, Globe Wireless, Northrop Grumman, Florida Tech, Rockwell, Nokia, and other local tech companies. Our rates vary by the season, and are very reasonable for the amenities and the location. See our rates and availability below. Melbourne Harbor is located in the town of Melbourne, on East Coast of Florida, near Melbourne. It is close to the intersection of US1 and SR192 in Melbourne. While here, you can walk to Historic Downtown Melbourne and enjoy all the Arts and Antique shops, along with a diverse group of restaurants to choose from. There is a Manatee Park on Crane Creek, a short walk down the street. Just across the river, the beach town of Indialantic has many quaint shops, surf shops, and restaurants. Crane Creek is also perfect for tranquil kayaking, and there are several other creeks within a few miles up and down the river. The beach with parking and public access is 2 miles to the east. Melbourne Golf Course is about a mile away, and there are 4-5 golf courses within a 15 minute drive. Tennis courts and several health clubs are within a 10 minute drive. 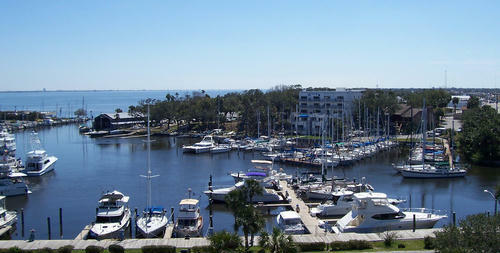 Melbourne Harbor is on the Indian River, and there are lots of river-oriented boating activities. There is an active sailing club across the harbor that welcomes visiting sailors. Check out our 'Things to Do' page for lots of other suggestions on where to go and what to do in the area. The area has a good bus service, from which you can access the mainland and the rest of the Space Coast. Drive time to other Florida Locations: Orlando, with all its major tourist attractions and malls, is about 1 hour drive away. The Florida cities of Jacksonville, Gainesville, Ft. Lauderdale, and Miami are all about 3 hours away. Daytona, West Palm, and Tampa are about 2 hours away. Cocoa Beach and Cape Canaveral are about 30 minutes away. The beach towns of Indialantic, Melbourne Beach are 5 minutes away. The beach towns of Indian Harbor Beach and Satellite Beach are 10-15 minutes away. or feel free to email me at the email address below.